A beautiful bird of prey flew into our yard and blessed both my husband and myself. Not being able to get out to nature these days, the Lord brought nature to us. 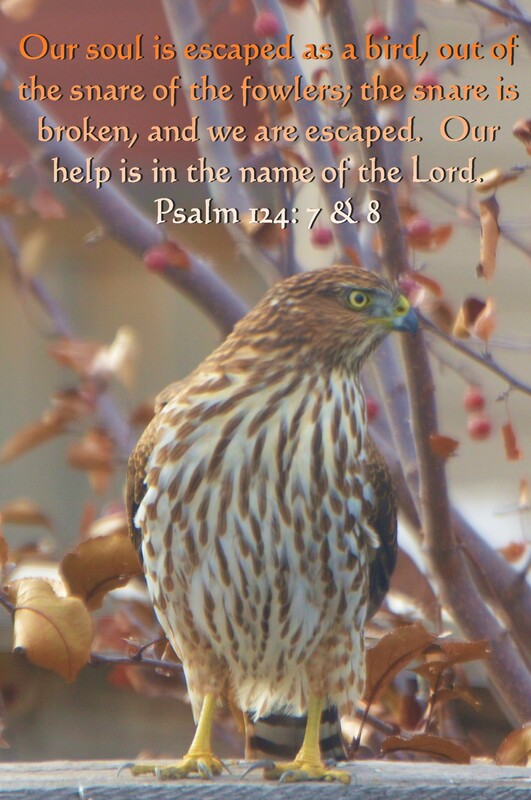 When ever I take a bird photo, I am always reminded of the above scripture. Our soul has been set free from the snare of the Fowler. We are escaped! The Fowler will try to snare us and lock us up on a daily basis if we let him. The devil is the Fowler, and the Lord has set us free from his snare. The devil has been trying to snare my mind and my husbands as well, but that beautiful bird coming into our yard reminded us that we are not trapped. We are free and able to live every moment with joy and thanksgiving. The above bird is a bird of prey, you can tell that by the hooked bill and talons. It was very large, about 14 inches tall. I believe it is a type of hawk. Have a wonderful day and take your freedom back from the Fowler, the Lord has set you free.